The Aquastorm is considered the industry's best for precision cleaning, performance, quality construction and life cycle durability. Combined with innovative features and technologies, the Aquastorm continues to be the industry leader and benchmark for cleaners in the industry. 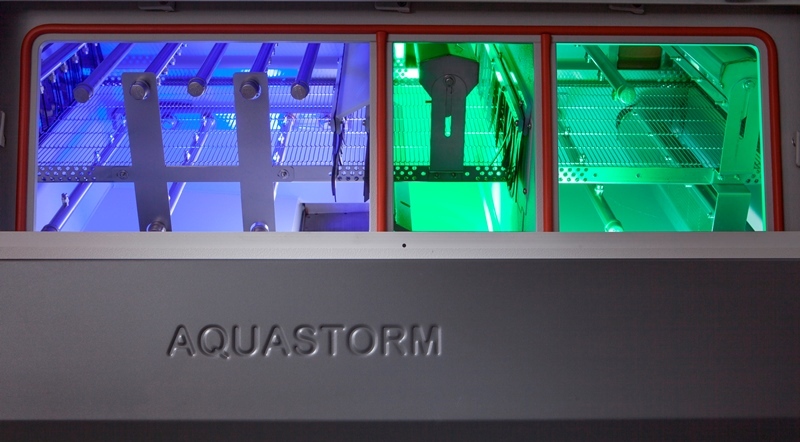 All process parameters are configured in the Aquastorms computer-controlled operator interface. Data logging and barcode capability are features that enhance and stremline the product process. As high-reliability PCBs become miniaturized, denser and more complex, board assemblers are seeking ways to increase board level reliability, and cleaning is seen as a process solution. Additionally, the importance of cleaning electronic assemblies increases dramatically in lead-free soldering applications. The Electrovert® Aquastorm™ series precision cleaning systems are designed to provide complete cleaning process flexibility, superior cleaning and drying performance, process monitoring, and reliability. The Electrovert approach is to provide the market with a range of Aquastorm series cleaners that utilize technologies that exceed cleaning and drying expectations. The Electrovert Aquastorm is a versatile, high performance cleaning system designed to optimize the PCB cleaning process while minimizing overall cost. The Aquastorm features the most advanced cleaning technologies in an energy-efficient design. The Aquastorm 100, in its compact size, offers the same process flexibility and capability as the Aquastorm 200. The Aquastorm 100 is also is ideally suited to RMA and no-clean de-flux applications that require chemistry, as well as removal of water-soluble organic acid flux. The Aquastorm utilizes technology-based solutions that deliver dynamic energy at the PCB surface to effectively clean under low stand-off and difficult to clean components. Leading edge spray technologies are used within the fluid delivery systems for both the wash and rinse cycles. Efficient and complete drying is critical to the cleaning process. An effective drying system will increase throughput, provide cost savings, and boards can go straight to test or conformal coating. The Aquastorm series offers several drying options, including the high performing Torrid Zone™ for unmatched flexibility in configuration and performance. The Aquastorm is configured with a Windows®-based operating system that provides familiar pull-down menus, includes data logging, and has barcode capability. The system is easily networked for down-loading of recipes and remote access to operating data. Important cleaning parameters such as flows, pressures, and temperatures are easily displayed on the GUI to optimize the machine and process controls. The clear advantage of the Aquastorm cleaners is the ability to deliver a combination of chemistry, thermal, and mechanical forms of energy at the PCB surface. Aquastorm utilizes mixed spray technologies including high-impact force for tight spaces, scillating action for low pressure applications and complete flooding action for high pressure applications. Jet Impact Cleaning with omni-directional spray patterns greatly improves cleaning under low-standoff components, and eliminates shadowing effects. Chemical Isolation provides optimal process separation and minimizes chemistry consumption. Electrovert offers several drying options that are designed to provide the greatest amount of value and process flexibility. Aquastorm in-line cleaners offer several integrated design features that save chemistry and electrical power. Automatic stand-by mode: The integrated automatic stand-by mode is standard within the Aquastorm in-line cleaners. This feature will automatically shut down pumps and blowers when PCBs are not being processed. The in-line cleaner will automatically start each pump and blower via an incoming photo cell detector as the PCBs enter the appropriate section of the cleaning module. This significantly saves power and chemistry consumption. 5 micron by-pass filter: An integrated filtration system continuously filters the wash batch fluid through a 5 micron filter. This helps filter the wash bath and extend the life of the fluid. Integrated exhaust plenum and demister: Aquastorm in-line cleaners utilize an integrated exhaust plenum that effectively balances the intakes of the exhaust ports within the cleaner. The exhaust plenum combined with the integrated demister ensures that exhaust is minimized which effectively saves on chemistry consumption. Torrid Zone Drying: The Torrid Zone drying system is designed to maximize the balance between thermal and mechanical energy within the drying process. The integrated design has proven to consume up to 40% less power over conventional drying systems. 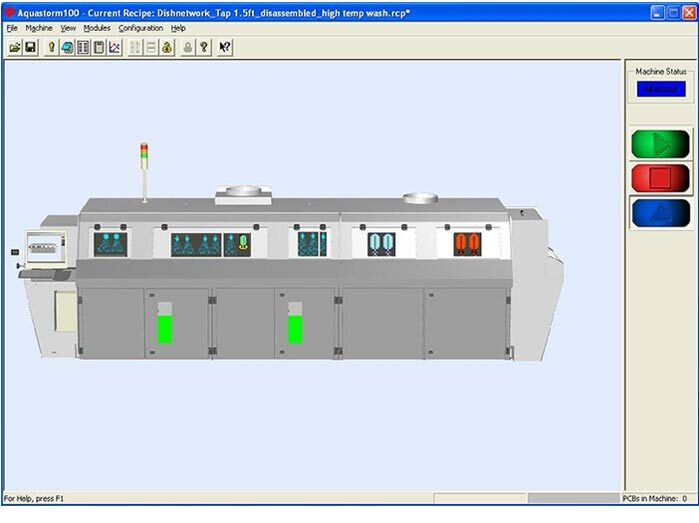 Commonality across Electrovert Platforms: Electrovert has focused on utilizing common materials, common I/O, and GUI software processes across all product platforms (wave, reflow, and cleaning). This provides cost savings in the form of spare parts (materials and I/O system) and significant savings on training of operators, engineers, and maintenance technicians (GUI software and I/O system). The Aquastorm series cleaners are designed to provide maximum in process flexibility and capability. Mixed spray technologies: Spray bars, manifolds, and pumps can be configured to provide the greatest amount of process flexibility and performance. Torrid Zone drying: The drying capability of Torrid Zone will ensure that both your current and future board designs will be dried within the cleaning system. Integrated chemistry concentration monitoring capability: The Aquastorm now offers software integrated chemistry concentration monitoring. All chemistry concentration parameters (percentages with user-defined alarm functions) are integrated into the machine software. All parameters are data logged for traceability and trending capabilities. Only available for specific chemistry types and brands. Straight DI and Chemistry Applications: The Aquastorm 100 can be configured for complete process flexibility and control as well as for value based solutions. The machine has a range of features and configurations that allow for straight DI and/or chemistry applications. Field upgrades - Electrovert always evaluates the feasibility of the technologies to be offered as a field upgrade. This allows existing users the opportunity to upgrade a current piece of equipment with new technologies. Check with your local sales representative on availability of new technologies as field upgrades.